← Looking for pirated Trados? 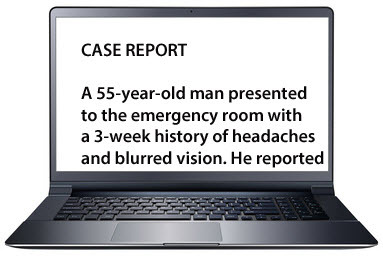 A case report is a narrative that describes, for medical, scientific, or educational purposes, a medical problem experienced by one or more patients.1 Translating a case report sounds straightforward. But is it? This blog post stems from a recent project in which I reviewed several case reports translated from Spanish to English. Ask your client where the case report is to be published. Journals usually have Instructions for Authors that you should read and follow. Some even have a case report template,5,6 so you may need to adapt the source text if the author hasn’t followed it. Pharmaceutical companies write case reports to show how safe and effective their products are. In this case, there may not be any specific instructions or templates at all. In general, a case report consists of an abstract, introduction, case presentation and discussion. This summarises the main points of the article. It may be written as a single continuous paragraph or structured under headings. Avoid abbreviations. This is the core of a case report. It starts by describing the presenting signs and symptoms, moves on to the physical examination and investigations, and ends with the diagnosis, treatment and outcome. Use the past tense and full sentences in a narrative format. Note that the verb present can take different prepositions. A patient presents to/at a hospital/outpatients’ clinic, but presents with initial signs or symptoms. However, when more signs and symptoms are mentioned, just use had or developed. Don’t get misled by the Spanish use of presentar, which is far more common than in English. Spanish case reports invariably use the present tense and a short, succinct style, even omitting indefinite articles. Mujer de 66 años de edad que acude a consulta. A literal translation (66-year-old woman attends clinic) illustrates the contrasting Spanish/English styles. In English, think full and flowing. Man/woman is used much more frequently than male/female as a standalone noun.4 In my non-native English corpus, use of man/woman and male/female was almost equal. A 72-year-old male presented with jaundice. Returning to my native English corpus, baby boy/girl is much more common than male/female baby. This section switches to the present tense. It describes similar cases and discusses the novelty of the reported case. It can also be used to explain treatment decisions. This case developed symptoms of… is incorrect. Other sections may be added after the discussion, such as a conclusion or simple take-home messages in bullet points. The patient’s perspective may also be included in the form of a verbatim account. Make sure you use the same register, without technical terms or medical jargon. The patient’s informed consent is important in a case report, because certain details (photos, occupation, race, city) may make the patient feel that he or she can be identified. As with other articles, case reports end with acknowledgements and references. Make sure you translate the Spanish heading bibliografía as references, not bibliography. This entry was posted in Medical, Spanish-English translation, Terminology and tagged case reports, English, español, genre, inglés, medical translation, medical writers, spanish, terminology. Bookmark the permalink. Hi Emma, speaking as a colleague who also works on case reports for clients, this post was directly relevant to me. I was especially interested to read of journal templates and I will look for these next time a case report lands on my desk. I recently helped a paediatric surgeon publish a case report and we discovered that her target journal actually had a sub-journal aimed solely at publishing case reports. However, she was gunning after another title with a higher impact factor and rejected this option. I also agree entirely with your take on tenses for different sections which is broadly speaking along the same lines as what I apply in my own work. Many thanks for this very interesting post! Thanks for your comment, Jason. It’s great to have the chance to work directly with the author for these projects. I often have an agency as an intermediary, which can add an extra obstacle to the process. Pingback: (ES) (EN) – Translating medical case reports into English: terms, templates and tenses | Emma Goldsmith | Glossarissimo! Hello, I work for a medical writing company and often get medical documents to translate from various foreign language into English. A proper template is definitely important but a medical writer should also ensure that none of the sensitive information is lost in translation. One of the biggest factors is cultural diversity; a person belonging to one culture might perceive a meaning differently than a person belonging to another culture and that can create misunderstanding. However, you have given me very good pointers for translating in this post. Thanks.